The proper way to express torque units is lbf·ft or N·m. New Years Resolution #1. We will make an effort to educate the masses on the proper way to express torque units. Looking at several scopes, manufacturer's specification sheets and other sources, as a metrology community, we do not always express units of torque properly. This means N·m is acceptable, lbf·in is acceptable, and lbf·ft is acceptable. ft·lbf or in·lbf is is not the conventional method for expressing torque. You will not find this as an accepted expression of torque in the ASTM torque standard (ASTM E2428) or any NIST handbook. You will find several manufacturers expressing torque the improper way. The foot-pound force (symbol: ft. · lbf) is a unit of work or energy in the Engineering and Gravitational Systems in United States customary and imperial units of measure. It is the energy transferred on applying a force of one pound-force (lbf) through a linear displacement of one foot. A pound-foot (lbf·ft) is a unit of torque or moment of force (a pseudovector). One pound-foot is the torque created by one pound force acting at a perpendicular distance of one foot from a pivot point. Torque is derived from the SI units of Length, Mass and Time. The metre is the SI base unit of length. The kilogram is the SI base unit of mass. The second is the SI base unit of time. Torque is expressed in terms of SI base units as m2 ? kg ? s-2. The improper use of torque units can easily be corrected. When you see manufacturers using ft·lbf on a torque specification, let them know the proper way to express torque is Force times Length. So remember to express torque in lbf·ft, lbf·in, lbf·oz, or N·m. It is important to note that N.I.S.T. does not currently offer torque calibration services. A list of NMI's (National Metrology Institutes) offering torque can be found on the BIPM website here. 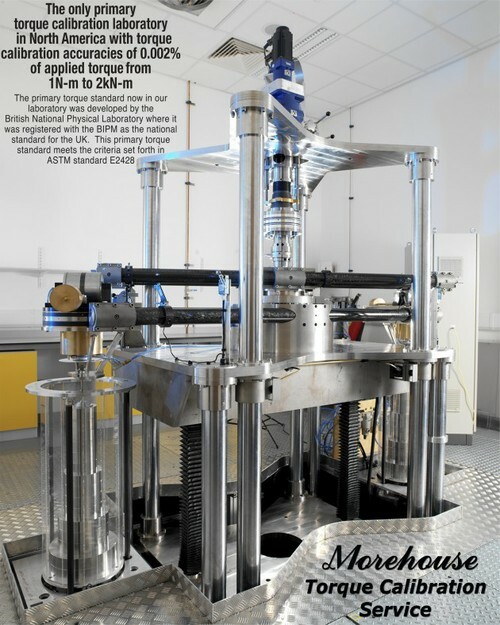 Morehouse currently has the second most accurate torque machine in the world. This is the most accurate machine in North America. We can achieve measurements better than 0.0025 % of applied torque from 0.5 through 1475 lbf·ft. Since NIST does not offer torque, Morehouse can provide torque measurements traceable to SI, through NPL for anyone in North America needing traceable torque measurements. More information on our torque calibration services can be found here.